'Widespread impacts of neonicotinoids "impossible to deny,"' says the headline at the BBC. The Worldwide Integrated Assessment (WIA) of the effects of systemic pesticides, a report released on June 24, concludes that the fairly new pesticides, neonicotinoids (neonics) and fipronil, are as bad for ecosystems as was DDT. The report was written by the IUCN, the International Union for the Conservation of Nature, after a review of 800 peer-reviewed journal articles published in the last 20 years. The IUCN is an environmental conservation group, and thus can't be said to be neutral in the debate over the role of these pesticides in ecosystems, particularly with respect to colony collapse disorder, but that certainly doesn't mean they are wrong. Systemic pesticides are water soluble chemicals and thus can be moved through a plant's vascular system to infiltrate its every cell, where they can remain for perhaps the life of the plant. Whatever eats the plant is then exposed to the pesticides, which, according to the BBC, are 6000 times more toxic than DDT (though, I am not sure what that actually means; that they last 6000 times longer, or kill 6000 times faster, or kill 6000 times the number of organisms?) but less toxic to mammals than some older classes of pesticide. According to the report, neonics and fipronil are the third most widely used pesticides in use today, and because they are so widely used, and prophylactically as well as for pest control after the fact, they are found in the air, the water and soil. And, they are affecting a wide range of organisms, perhaps including us. Yep, you might be eating them for dinner. The combination of prophylactic use, persistence, mobility, systemic properties and chronic toxicity is predicted to result in substantial impacts on biodiversity and ecosystem functioning. The authors of this report recommend worldwide reduction in their use, continued research into alternatives, such as integrated pest management, and tighter regulation. Pesticides are meant to kill, so that they are doing their job is no surprise. But the most pressing question is whether they are also responsible for colony collapse disorder (CCD). The European Union has banned the use of neonics for 2 years, in an attempt to answer this question. However, there is currently some pressure from the National Farmers Union of combinable crops in Britain to overturn the ban in time for autumn rapeseed planting -- without them, growers warn, 2014 could be the last big harvest in Europe. Of course, the NFU can't be said to be a disinterested party, either. And, despite the report pesticide manufacturers (another party with a vested interest) deny that these chemicals are responsible for CCD, citing, for example, the persistence of tree bumblebees despite two decades of neonicotinoid use. CCD, the sudden disappearance of worker bees from a beehive or colony, usually occurs with little or no build-up of dead bees in or around the affected hives, and with the early death of adult worker bees away from the hive. This leaves affected hives populated primarily by young adults. 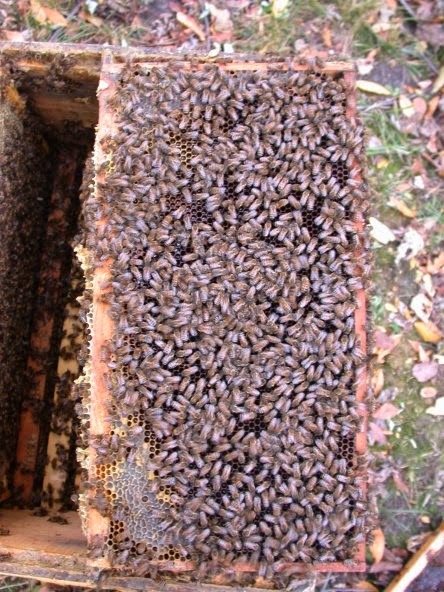 The queen is usually in the hive as well, but without worker bees the colony can't sustain itself, and the remaining bees eventually die. 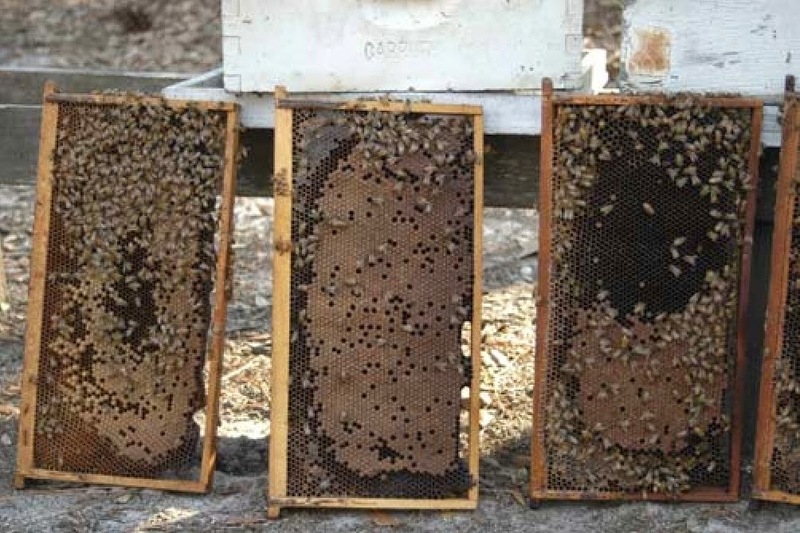 Winter is hardest on bee colonies, though since CCD was first reported, the proportion of beehives that die during a given winter has ranged from the expected 10% or so to bad winters such as the winter of 2013-14, with 60% or more of hives dying off in some areas. Why this is happening is not at all clear -- perhaps varroa mites, perhaps a virus, perhaps overwork and stress, perhaps neonicotinoids, perhaps a combination of factors. Indeed, CCD had not hit Canada or Australia until recently, although neonics have been in use in both places. But, varroa mites weren't a problem in Australia, either, so it's hard to know what this means about the cause of CCD. Colony collapse disorder has become politicized, in part because a lot of money is at stake, and in part because environmental protection is itself politicized. It's the same kind of conservative vs liberal hate-fest, or, in this case, food-fight that we also see over the truth of evolution and climate change. It doesn't help, of course, that understanding why bees are dying is so difficult. But, similar questions arise in many other areas these days, like: what causes autism, or obesity, or hyperactivity? Identifying the cause of a complex disorder turns out to be difficult, and 'cause' may not even be the appropriate word, though we seem to have no better. The WIA report will not end the debate. There will be charges of vested interest on both sides, and there will be inaction. Environmental consequences of pesticide use will mount, and bees will continue to die. But, for hungry humans, they may have the last sting.